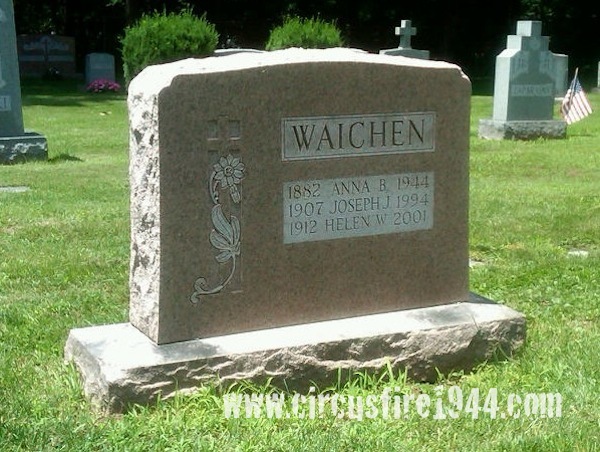 Mrs. Anna Barbara Waichen, age 62, of 19 Golway Street, Manchester, was born in 1882 in Lithuania and immigrated to United States in 1913 with her husband and son. She was found dead at the circus grounds after the fire on July 6, and was buried at St. Bridget's Cemetery in Manchester. 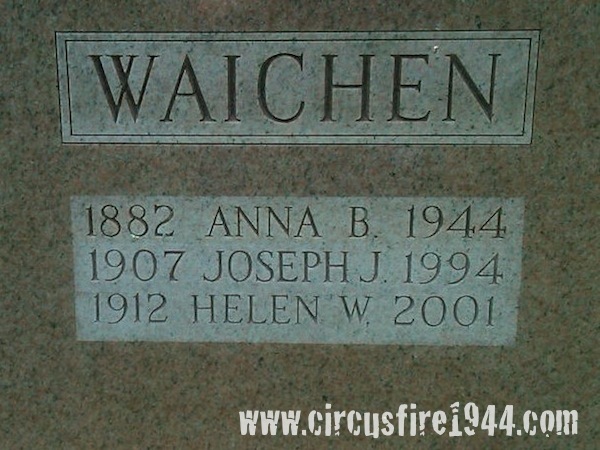 Mrs. Waichen leaves her son, Joseph J. Waichen, 36, and three daughters: Miss Helen W. 'Nellie' Waichen, 31, of New York City; Mrs. Adelle 'Ella' August, 37; and Mrs. Sylvia Songailo, 25. Nellie and Sylvia accompanied Anna to the circus, and were able to escape. Mrs. Waichen was predeceased by her husband, Victor, in 1930. Body #4508 was identified at the State Armory as Anna Waichen by her son-in-law on Friday, July 7, and on the body was found a ring and a wedding ring. It was reported that in 1930, Anna's husband set the family home on fire, left the house and took his own life by hanging. Anna, who had been ill and was bedridden at the time, was carried out of the house by her son Joseph. Daughter Nellie was also in the house and was able to escape without harm. The estate of Anna Waichen was awarded $6,500 by the arbitration board.